I must apologize for forgetting all about the $50 chickdowntown.com gift certificate drawing. The problem? No Post-it note on my computer screen. These days if I don't Post-it note it, I'm screwed. So if you haven't put your name in the hat yet, go here and comment. Drawing tomorrow at noon, because my Post-it says so. And for some visuals, a few wild pics from Monday night's FIT Senior Show. I think this class was even stronger than last year's, and the show was, as always, a totally enjoyable fashion experience. See? Plaid and shiny leggings, furry skirts, and big fans. Now that's entertainment. Many more FIT pictures tomorrow. 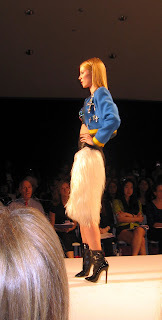 Oooh, I need me a furry skirt. More "Why I Love Gap 34th Street"